REEL GOOD: Chris Vasilevski catches a gummy shark. Gummy shark were popular this week with catches in excess of 20kg locally. 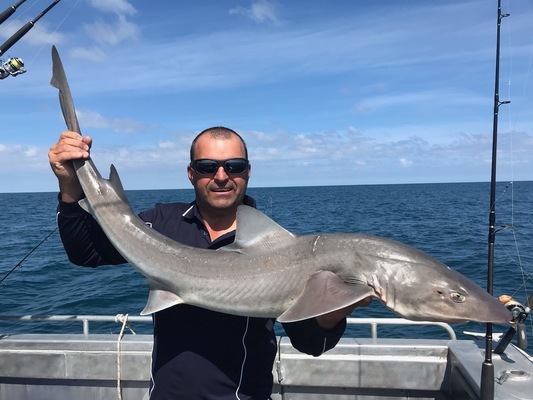 Chris Vasilevski from Gone Fishing Charters guided clients onto a number of gummy sharks while fishing offshore from Barwon Heads in 30m of water. Using fresh-caught slimy mackerel as bait, they caught sharks ranging between 10-15kg, with two over 20kg. Fishing nearby between Barwon Heads and Breamlea in 20-35m of water saw small snapper caught to around 2kg. Using squid or pilchard fished on the bottom resulted in bag limit captures. Paul Carson reports exceptional squid fishing currently on offer at Clifton Springs. Fishing over weed beds in 3-5m of water, Paul and a mate caught their collective bag limit of 20 squid with nearly half having hoods about 45cm, which Paul reports as being the biggest he’s seen in a while. They found that using squid jigs in size 3 and in pilchard blue colour were most effective. Barwon River estuary at Barwon Heads has provided fantastic fishing for anglers on the shore and jetties downstream of the bridge. Using squid and bluebait around a high or low tide change saw anglers catch silver trevally, salmon and King George whiting. Fishing further upstream at the end of Sheepwash Rd was also popular with trevally and the odd mulloway still being caught at night. Portland remains the hotspot this week for anyone chasing barrel tuna with 7-9 inch skirted lures like Pakula Brad J lumo and Tornado T7s in 30-50m of water. Behind Lawrence rock was popular for fish potentially more than 100kg, while fishing off the shelf in 100m of water saw school fish about 10kg caught. Redfin are on the bite at Wurdibuloc reservoir despite the current low water levels. Casting metal spoons from the west side of the lake and shallow running lures around the weed beds at first light saw fish up to 40cm caught. The odd trout has also been caught and as the weather cools we can only expect the trout fishing to improve with bigger fish also becoming active.